Time to continue with some reviews of gear used in Russia. 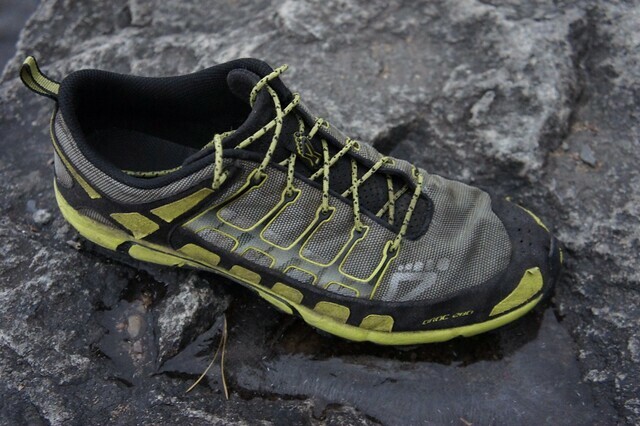 My footwear were the Inov-8 OROC 280, a lightweight trailrunner with spikes to give extra grip. I was the only person to use trailrunners on this expedition, all the others used rubberboots. Lets have a look, shall we? The important bit: Weight for the pair in Size 42,5 is 567 g.
What makes this shoe stand out - besides the colour - is that it has before mentioned spikes, a whopping nine of them to be correct. Six under the forefoot, three under the heel, guaranteeing you solid grip on every surface (except marble floor, on which it is damn slippery). Every surface means for me rock, ice, mud, tree roots, swamp, forest ground, be they normal, wet, flooded or frozen. Nine spikes to rule them all. Ähem, have splendid grip on any surface. The shoe is super breathable, dries quick and is absolutely not waterproof, just as I like them. The laces seem to be made of some kind of dyneema material, at least they are a lot thinner and stronger than normal laces, again something I prefer - they keep knots better than the normal lace materials. 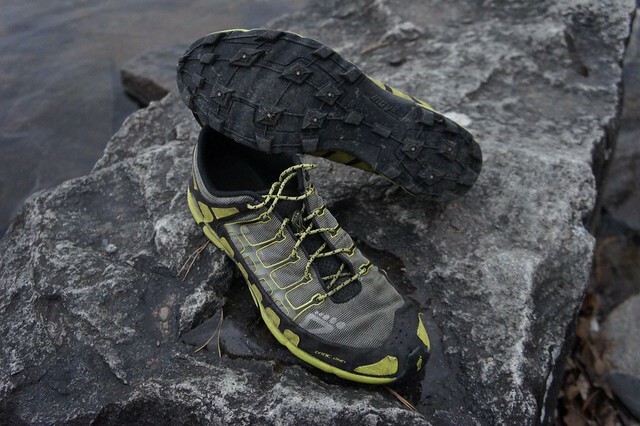 The upper is made of neopren, and Inov-8 tells us it helps to protect us better from dirt and debris. The truth is I still get all kind of grit in them if I am not wearing gaiters. The OROC 280 has the Endurance sole, which is in my experience just as grippy as the Slicky sole, but your milage may vary. The profile of the shoe is similar to the Roclite, which is to date my favourite profile for outdoor shoes. 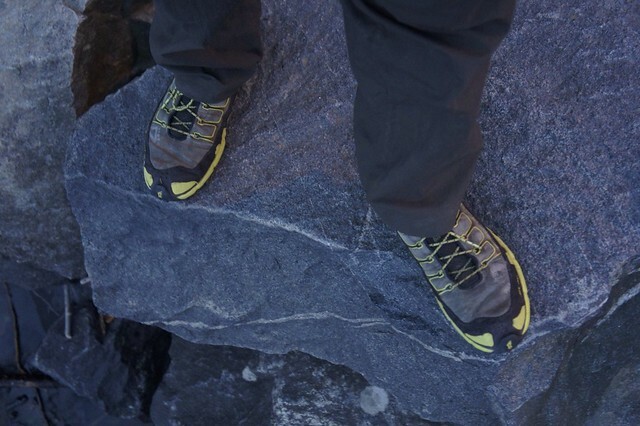 As durability is something that is always asked about, I have walked over 200 km in my OROCs so far, and yet have to see problems with endurance, but I also only wear them for trailrunning and backpacking. I would say the footbox is normal to narrow, if you have wide feet in the front then you might want to look at another shoe, but for folks with narrow to normal feet these are fine. Now, with the winter upon us, these trailrunners allow you to walk save on icy trails, lakes and mountains without needing spikes or similar, thus a useful piece of kit if winter doesn't send you back indoors and crampons would seem like overkill for your trips. I can't think of anything I don't like about them at the moment. Improvements? Well, all black would be cool, obviously. I was thinking if two additional spike even further at the front would make sense, as I walk/ run with the front of my foot striking first and this could give a tiny bit more traction an real slippery surfaces, but after some more consideration I came to the conclusion that they're fine as they are. Well, except if they'd come in all black, obviously. All in all a very lightweight, fast shoe with great grip, good durability and fine looks =) Sadly the usual suspects don't seem to have the shoe currently in their line-up, so I suggest if you like a pair that you email them and ask if they can get it for you, or visit your local outdoor shop and get them there!